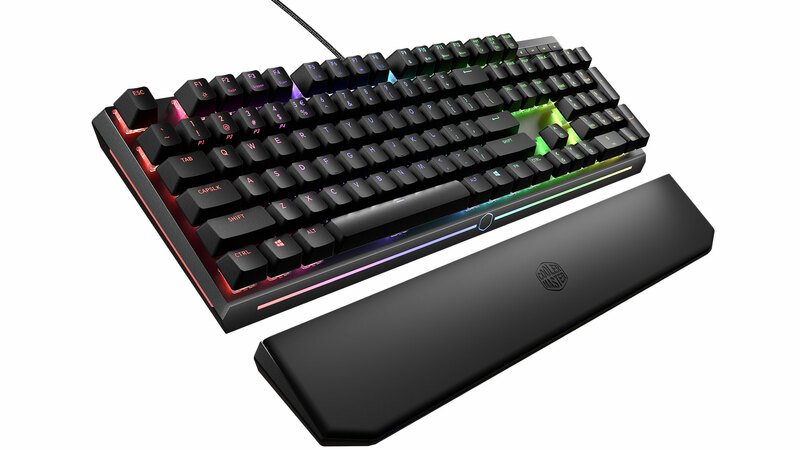 Cooler Master has developed a solid range of keyboards in recent years within its MasterKeys family, and now it’s looking to outdo itself with a new flagship model, the MasterKeys MK750, a full-size board which will sit above the MasterKeys Pro L RGB. The price of £140 is certainly steep, but it isn’t out of line with what you could expect to pay for flagship keyboards from other major brands in the market. There is clearly a market for these boards, and it would be daft for Cooler Master not to get in on the action. As we’ve become accustomed to, Cooler Master’s build quality is top notch. It’s opted for the popular look of an aluminium faceplate with raised keys in a frame that’s simple, minimalist, and has a small footprint. Rubber pads on the bottom, including on the flick-out feet, give it the necessary grip for aggressive play. Cherry MX RGB switches are chosen, so high quality is a guarantee. Our review unit has Blue switches, but mass production UK samples will have Browns only, at least to begin with. While this technically means we’re not reviewing the same exact keyboard users will get, the quality and reliability of Cherry MX switches of any colour means we’re confident that they will be great. A new addition is the removable wrist rest that attaches magnetically, albeit rather weakly. With memory foam internals and a pleather exterior (think headset earcups), it's very comfortable to rest on and thick enough to actually provide a legitimate amount of support – we much prefer it to Corsair's. It has its own set of rubber pads on the underside, too, and typing with it in place is very comfortable. As expected, 1,000Hz polling and n-key rollover ensure the keyboard won't skip a beat. The keyboard's cable is removable and uses a reversible Type-C connector on the keyboard side instead of the usual mini-USB – a nice modern touch. The cable itself is 1.8m long and braided, and it can be routed via channels on the bottom out of the centre, left, or right of the board to suit your desk. The four dedicated media keys in the top right have no symbols printed, instead relying solely on light (or you memory once you're used to them) to tell you what they do. Volume up and down functions are available only through FN and the PgUp and PgDn keys. Corsair definitely has Cooler Master beat here; the K70's keys are clearer, higher quality, and include a lovely volume wheel. Just how much RGB can one keyboard have? Quite a lot, says Cooler Master. As well as per-key RGB lighting courtesy of the RGB variety of Cherry MX switches, side- and front-mounted RGB light bars also adorn the MK750's chassis, and again these are controllable. They are thankfully rather subtle, perhaps too subtle for some: With the wrist rest in place, none are actually visible to the user from a normal position. The layout is completely standard, so those interested in using custom keycaps needn't worry about undersized buttons on the lower row like with Corsair. 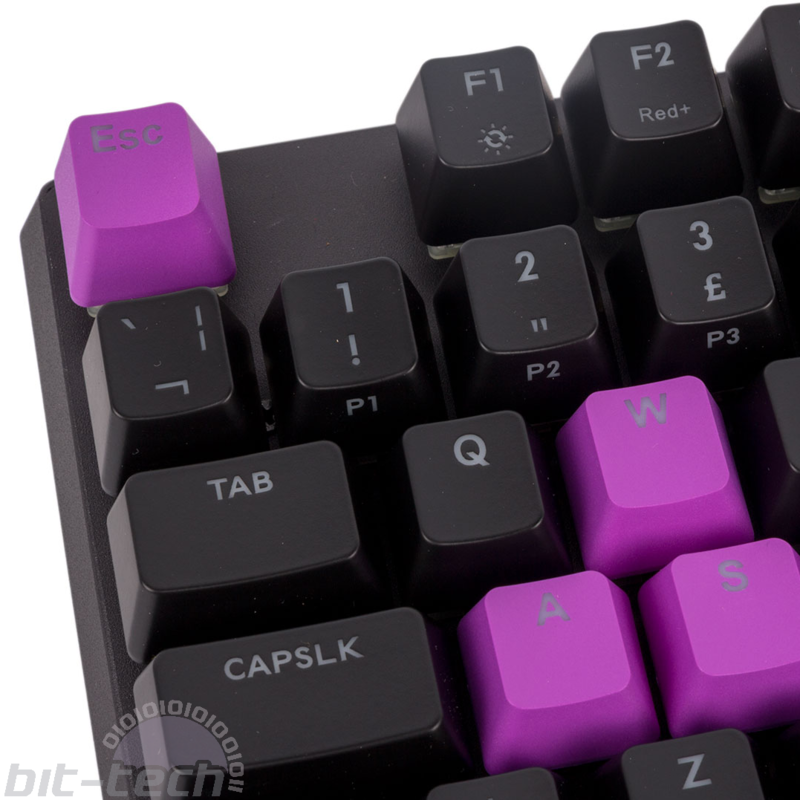 The keyboard also comes with a keycap puller and nine (Esc, WASD, and arrows) purple keycaps moulded with double-shot plastic for additional durability – they feel the same as the others when typing, though. These do not have the secondary symbols of the keys they replace, however. For customisation, Cooler Master employs an approach we're fond of, which is to have numerous on-the-fly/plug-and-play functions thanks to an ARM Cortex processor and onboard memory. These are then complemented by a software suite used to enhance and add a few extra functions. Four custom profiles are accessed with FN and keys 1-4, while a default, non-customisable profile can always be reached with FN and Esc. The hardware can also be used to reset the settings of one or all profiles and to lock the Windows key or even all keys. Holding down FN reveals the current profile in use via white lighting, while similarly the caps, num, and scroll lock buttons each act as their own indicators using a colour of your choice. Recording a macro is achieved by hitting FN and F11, which illuminates all available keys in blue. Hit a key to choose it, record your macro, then choose whether you want it to be a single playback, loop, or infinite loop. FN and Esc ends the process, after which the key will now be red to show that it has a macro associated with it. You can easily delete macros with FN and F12, which again shows you all the keys in red or blue – simply hit the one you want deleted, and hit FN and Esc to return to normal use. 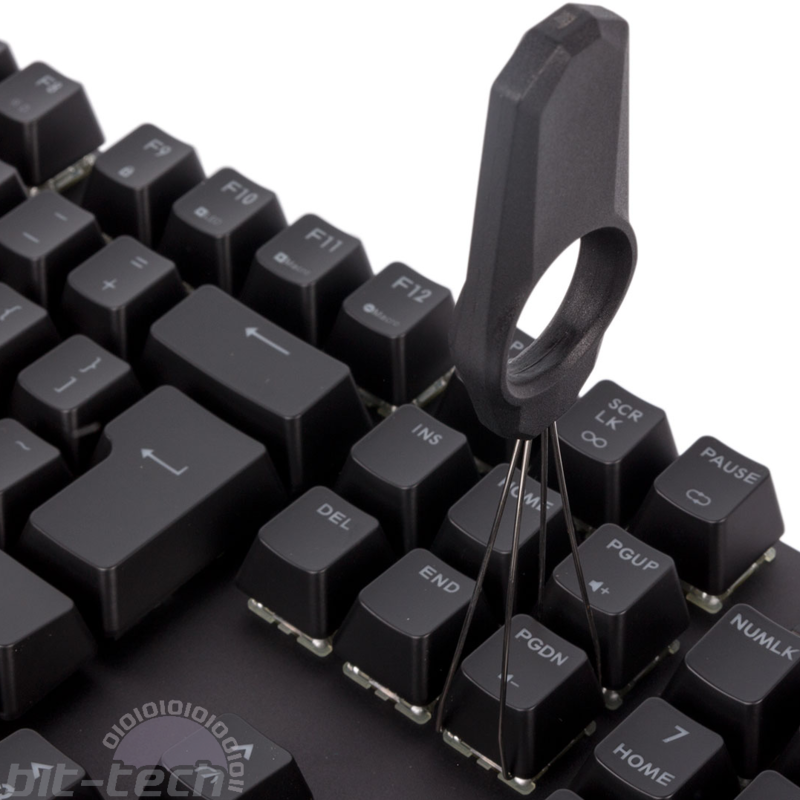 As macros execute, the keys being triggered flash white. FN and F5 cycles through various lighting effects, while FN and F1 cycles through a number of different colour choices for that chosen effect. The arrow keys can control speed and direction if applicable as well, while FN and F10 are used to enter lighting recording. In this mode, FN is used with F2 (red), F3 (green), and F4 (blue), each of which has 10 different brightness levels that you can mix and match to reach a desired colour – the FN key shows the currently selected colour. You then hit all the keys you want in that colour. It's an impressive level of control for a hardware-only solution, but if it all sounds too much for you, you can easily use the software to program the keyboard instead.